It was the last game of the season, so emotions ran high, and a Grady win made the ending bittersweet. 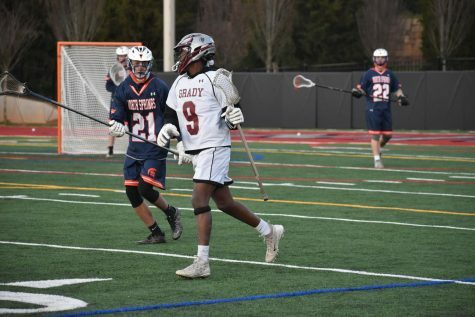 The Grady boys lacrosse team came from behind to defeat North Atlanta 9-8 on Friday, May 4 at Grady Stadium. The game was hot, dry and sunny, making for a very sweaty game for everyone involved. Grady Stadium was spotted with parents and few Grady supporters. Before the game began, both teams prepared themselves for the upcoming conflict and chanted while clashing their sticks together. The tension built between the two teams, both of whom were playing their last games of the season. Grady (5-12) scored first, beating the North Atlanta goalie with eight minutes left in the first quarter. Bilal Vaughn made multiple blocks as goalie and did his best to prevent as many shot as possible from North Atlanta. Grady added two more goals while North Atlanta (3-12) added only one. Night fell upon the stadium and light poured onto the game from the field’s large overhead stadium lights. North Atlanta attempted to make a comeback by scoring three points, prompting a Grady timeout. Soon after the timeout, Grady scored twice. The first half ended with the Knights ahead, 5-3. The second half played out a bit differently, as North Atlanta made a strong push. Grady scored two more points, but the Warriors pushed back and scored four unanswered goals to tying the game at 7. 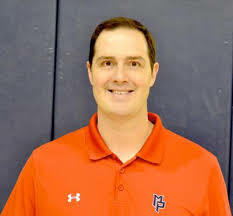 With the last game of the season on the line, the Knights embraced their inner heroes and scored two more points to North Atlanta’s one, clutching a victory that nearly eluded them. Declan Farrisee scored three goals for Grady. Tray Evans and Jacob Friesan both added two. Overall, the team seems to be very happy with how they played this season. Emotions ran high at this last game of the season, and with the Knights victorious, it seems it couldn’t have ended any better.